Marlborough was not among the filming locations in the first Hobbit movie, but the tourism officials still hope the region can cash in on the buzz created by the film franchise. The films seem set to bring another tourism boost similar to that from The Lord of the Rings trilogy as travel websites reported significant growth in searches and bookings for New Zealand after the worldwide release of The Hobbit: An Unexpected Journey last month. 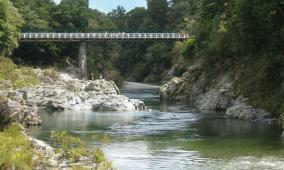 Scenes for the The Hobbit (Ed note: the barrels out of bond scenes) were filmed at Pelorus Bridge last year, but the decision to split the story into three films means Marlborough will not feature until the second film, which is scheduled to be released on December 13.